Sometimes I feel like an elephant trying to balance on a beach ball. Finding balance in life is not always easy. I tend to get super overwhelmed if I don't get a million things done that I should have. I have said before how I hate lists...but maybe I should give in and get more organized. Its a tricky business doing the things that you need to do rather than doing the things you want to do. Need= call clients and schedule treatments. Want= dilly dally around on Pinterest and waste time ha! How do you balance quality husband or boyfriend (hopefully you don't have both) time, family, kids, friends (important too) work, personal time for yourself...and all the other little slices of life? On a side note: Thank God for wine..I will be having a glass or two tonight. I just picked up a bottle of Cabernet called "Twisted." The label is what got me...ahh I am such a sucker for a cool wine bottle label. I second the wine comment! I will be having a glass or two while I catch up with an old friend who is here for a few days! Right now I don't have to balance boyfriend time (i know that sounds bad) but we are 15 hours apart. The hardest thing is trying to find a good chunk of time to have a decent phone conversation. I find that if I don't write down things I have to do I just wont do them. I secretly like crossing things off my to do list! Who in the world would have the time for husband AND boyfriend, lol. I third the wine comment and will be pouring soon. I am a big one for planning. I love to make lists and squeeze in time for things I love to do; however, and this is a big however, I don't have any children and so I can't imagine how moms get anything done. Balancing my time is something that I have always struggled with. Although it's funny it seems like the more I have on my to-do list the more productive I am (I think because I have to schedule out my time or nothing will get done.) I have always been a "list" kind of girl...it makes me feel better when I can check things off, even if I didn't accomplish everything on the list. My husband and I make an effort to have a fun "night-in" on friday or saturday night. We cant really afford a babysitter every weekend but once the little guy is in bed, we make something sweet and watch a favorite movie or something! Okay, seriously now people, who needs anything else when you've got the wine?! Finding balance can be so hard! I'm juggling three jobs as a full-time college student with my boyfriend going to college in a town 20 minutes away. Having an understanding, low-maintenance man makes things easier. Finding the way to balance between friends and the boy on the weekends is the hardest! Sometimes, try to incorporate the two together. Obviously they both deserve separate times, but sometimes it can be so much more fun to combine the two, and keep a little stress off your plate! cross boyfriend of the list. check. grab bottle of wine. check. blog when husband isn't home. check. Ugh.. Balancing. So hard. But I am with you, without having some drinks to indulge in.. Life would be much tougher! Great post! it's impossible, but you always work to have it. you can never stop trying. and the wine helps. a lot. I struggle with this too. For me, I have to check off all my needs, before I can get to my wants. It's a constant struggle. Glad I'm not the only one who feels this way. When it all comes down to it, if my child is really needing my attention, I will drop whatever I am doing & attend to them. 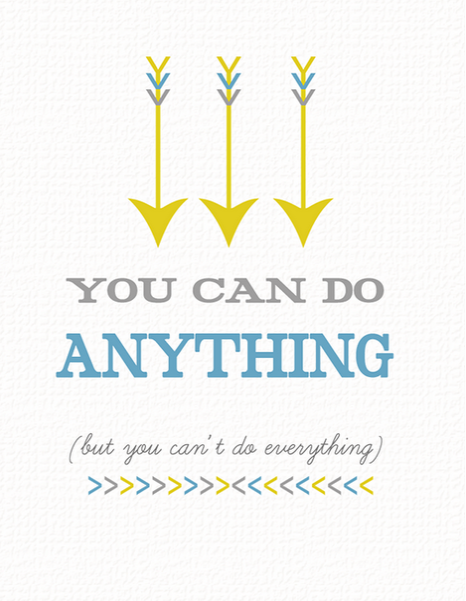 this is a great message....sometimes i really think i can do everything but in the end..i can't! and that's ok too....one day at a time! To-do lists are actually kind of fun. Only put the really important stuff on there. It's fun to cross stuff off. You could always set reward levels for yourself (i.e. if I get five of these ten things that MUST be done done, hubby and I can watch movie). I personally don't have to worry about budgeting time for kids or friends (as I have neither), so I have an advantage. Still, try the casual to-do list! Sometimes I get the "Anything" and "Everything" mixed up in that saying lol. As of now I only have 1 child and a hub so I just stick on a schedule, but I have a feeling as I have more kids, there will be less organization lol. I feel that way right now...pulled in 50 different directions, getting nothing really accomplished and getting more stressed by the minute. And yes, the wine helps! I am still trying to figure out my balance. I work full-time, drive an hour to and from work, workout, cook dinner, keep up with my blog, etc., all while trying to find some quality time with my hubby who has his own business and is still struggling with figuring out his own balance. Some nights, we're lucky if we see each other for an hour! But, I can say that for those times that we do have together, we make sure that nothing else distracts us from our own quality time. It is so important! Really must stop trying to do everything and then achieving nothing! So hard to find a balance! I so needed to read this post today. Nice to see that we're all struggling with finding balance! Thanks for stopping by pretty lady! girl i hear ya. balancing LIFE is hard!